This page provides you with training sessions that you can use at Open Studio or for your own workout at home. These sessions call for heavy bags, weights, and other equipment that you can find at the studio but, you can always modify if you want to do them at home. Great for keeping in condition and practicing. Warm up: Knee ups, jumping jacks, lunges, 3 sets of 1 minute on jump rope. Patterns: Two patterns seeing if you end where you started. Use moderate power. 10 outside front leg crescent each side. Make sure you are pivoting on non-kicking foot toward the bag. Patterns: Two patterns seeing if you end where you started. Use full power. For this session, you can either do the same pattern or multiple different patterns. Patterns: 5 patterns in a row. No break. This can be the same or different patterns. Patterns: 5 patterns no break. Do 2 slow motion holding your kicks and punches. Warm up – this should be a good warm up. Jump rope for 1 minute three times, high rising ups, high rising sides. Make sure you are doing dynamic stretches. Fit in lunges and squats with weights. Tornado kicks – Crescent and hooking. That’s turning to your back and turning to your front. Start with just advancing then add jumping. Jump rope 1 minute or 1.5 minutes 3 times with 30 second break in between. 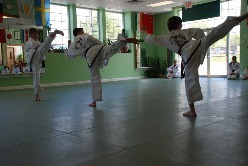 Jab, cross, hook - try alternating across room – you step forward with back foot after hook – up an down the room. Jab, cross, hook, upper-cut. As above, alternate across room. Step forward with back foot after upper-cut – up and down the room. Spar for 1 minute jabs, crosses, hooks, upper cuts – face and body. Dodge, move feet, control the bag. Break 30 seconds and repeat once more. 1. 20 Sit ups with Standing Heavy bag and bands. The work is going down.